BackgroundIt has been realised that there is need to have medical training closer to communities where the majority of the population lives in order to orient the trainees’ attitudes towards future practice in such communities. Although community based education (CBE) has increasingly been integrated into health professions curricula since the 1990s, the contribution students make to service delivery during CBE remains largely undocumented. In this study, we examined undergraduate health professions students’ contribution to primary health care during their CBE placements.MethodsThis was a qualitative study involving the Medical Education for Equitable Services to All Ugandans consortium (MESAU). Overall, we conducted 36 Focus Group Discussions (FGDs): one each with youth, men and women at each of 12 CBE sites. Additionally, we interviewed 64 community key-informants. All data were audio-recorded, transcribed and analysed using qualitative data analysis software Atlas.ti Ver7.ResultsTwo themes emerged: students’ contribution at health facility level and students’ contribution at community level. Under theme one, we established that students were not only learning; they also contributed to delivery of health services at the facilities. Their contribution was highly appreciated especially by community members. Students were described as caring and compassionate, available on time and anytime, and as participating in patient care. They were willing to share their knowledge and skills, and stimulated discussion on work ethics. Under the second theme, students were reported to have participated in water, sanitation, and hygiene education in the community. Students contributed to maintenance of safe water sources, educated communities on drinking safe water and on good sanitation practices (hand washing and proper waste disposal). Hygiene promotion was done at household level (food hygiene, hand washing, cleanliness) and to the public. Public health education was extended to institutions. School pupils were sensitised on various health-related issues including sexuality and sexual health.ConclusionHealth professions students at the MESAU institutions contribute meaningfully to primary health care delivery. We recommend CBE to all health training programs in sub-Saharan Africa. Objectives To investigate and synthesize reasons for low access, initiation and adherence to antiretroviral drugs by mothers and exposed babies for prevention of mother-to-child transmission (PMTCT) of HIV in sub-Saharan Africa. Methods A systematic literature review was conducted. Four databases were searched (Medline, Embase, Global Health and Web of Science) for studies conducted in sub-Saharan Africa from January 2000 to September 2012. Quantitative and qualitative studies were included that met pre-defined criteria. Antiretroviral (ARV) prophylaxis (maternal/infant) and combination antiretroviral therapy (ART) usage/registration at HIV care and treatment during pregnancy were included as outcomes. Results Of 574 references identified, 40 met the inclusion criteria. Four references were added after searching reference lists of included articles. Twenty studies were quantitative, 16 were qualitative and eight were mixed methods. Forty-one studies were conducted in Southern and East Africa, two in West Africa, none in Central Africa and one was multi-regional. The majority (n=25) were conducted before combination ART for PMTCT was emphasized in 2006. At the individual-level, poor knowledge of HIV/ART/vertical transmission, lower maternal educational level and psychological issues following HIV diagnosis were the key barriers identified. Stigma and fear of status disclosure to partners, family or community members (community-level factors) were the most frequently cited barriers overall and across time. The extent of partner/community support was another major factor impeding or facilitating the uptake of PMTCT ARVs, while cultural traditions including preferences for traditional healers and birth attendants were also common. Key health-systems issues included poor staff-client interactions, staff shortages, service accessibility and non-facility deliveries. Conclusions Long-standing health-systems issues (such as staffing and service accessibility) and community-level factors (particularly stigma, fear of disclosure and lack of partner support) have not changed over time and continue to plague PMTCT programmes more than 10 years after their introduction. The potential of PMTCT programmes to virtually eliminate vertical transmission of HIV will remain elusive unless these barriers are tackled. The prominence of community-level factors in this review points to the importance of community-driven approaches to improve uptake of PMTCT interventions, although packages of solutions addressing barriers at different levels will be important. 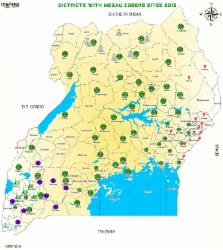 Access to and utilisation of health services for the poor in Uganda: a systematic review of available evidence. Inequalities in the burden of disease and access to health care is a prominent concern in Uganda and other sub-Saharan African countries. This is a systematic review of socio-economic differences in morbidity and access to health care in Uganda. It includes published studies from electronic databases and official reports from surveys done by government, bilateral and multilateral agencies and universities. The outcome measures studied were: the distribution of HIV/AIDS; maternal and child morbidity; and access to and utilisation of health services for people belonging to different socio-economic and vulnerability groups. Forty-eight of 678 identified studies met our inclusion criteria. Results indicate that the poor and vulnerable experience a greater burden of disease but have lower access to health services than the less poor. Barriers to access arise from both the service providers and the consumers. Distance to service points, perceived quality of care and availability of drugs are key determinants of utilisation. Other barriers are perceived lack of skilled staff in public facilities, late referrals, health worker attitude, costs of care and lack of knowledge. Longitudinal and controlled studies are needed to see if strategies to improve access to services reach the poor.